The Southeast Based Coalition of Human Rights Organizations (SBCHROs) comprising: International Society for Civil Liberties & the Rule of Law (Intersociety), Anambra State Branch of the Civil Liberties Organization (CLO), Center for Human Rights & Peace Advocacy (CHRPA), Human Rights Club (a project of LRRDC)(HRC), Forum for Justice, Equity & Defense of Human Rights (FJEDHR), Society Advocacy Watch Project (SPAW), Anambra Human Rights Forum (AHRF), Southeast Good Governance Forum (SGGF), International Solidarity for Peace & Human Rights Initiative (ITERSOLIDARITY) and Igbo Ekunie Initiative (pan-Igbo rights advocacy group) have reviewed ravaging socio-political events in Nigeria, particularly the Federal Government’s continuing violent approaches to the issue of pro-Biafra agitations and sustained threats from the Southeast deadly politicians. 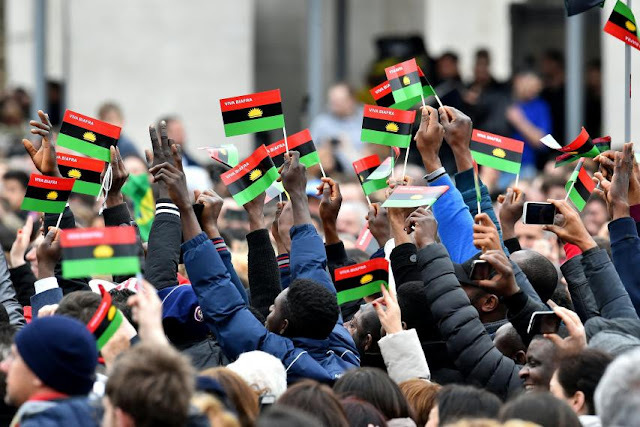 The latter have mindlessly engaged in playing deadly politics and pursuit of their violent political goals as well as the use of names of the Pro-Biafra agitation and its frontline campaigning bodies and persons (i.e. IPOB and Mazi Nnamdi Kanu) as a conduit pipe to earn blood money or fortunes from the Buhari administration. Having critically reviewed the foregoing bearing in mind clear provisions of the fundamental human rights and the fundamental objectives and directive principles of State policy provisions of the 1999 Constitution and relevant regional and international treaties and conventions willingly acceded to by the Federal Republic of Nigeria; we have firmly resolved to continue our collective advocacy support for the nonviolence avowal of the Pro-Biafra Agitators as long as the principle is strictly adhered to by IPOB and ors. We have further resolved to stop at nothing in rising against the Buhari administration and ensuring that its principal perpetrators are made to face justice locally and internationally over their ignoble regime atrocities against IPOB and ors. The central and affiliate leaderships of Southeast Based Coalition of Human Rights Organizations (SBCHROs) are ardent proponents of nonviolence or pacifism and opponents of use of violent approaches in response to nonviolent assemblies and exercise of rights to nonviolent defense of ethnic identities, development and self-determination enshrined in the African (AU) Charter on Human & Peoples Rights of 1981 (ratified and domesticated by Nigeria in 1983) and the UN’s International Covenants on Civil & Political Rights & the Economic, Social & Cultural Rights of 1976 (signed and ratified by Nigeria in 1993) . We wish to state firmly that we shall never support any State or group violence in pursuit of the right to self-determination or otherwise. Which is why we have consistently come out boldly in support of the nonviolence approach of the IPOB and risen in total condemnation of coordinated violent attacks against it and its sister non-violent bodies by the Government of Muhammadu Buhari. On the sovereignty status of the Federal Republic of Nigeria under which the Buhari administration has hidden to unleash widespread State violent attacks and jungle justice against the Pro-Biafra agitators and their leadership particularly the IPOB; we wish to align ourselves totally with the advocacy position taken by the intersociety, which seminally informs that rigidified sovereignty or sovereignty of compulsion is long outdated and out-fashioned; and has been replaced by negotiable sovereignty or sovereignty as a responsibility or citizen-sovereignty. The Buhari administration of the old brigade, is therefore, urged to come to terms with this modern reality and turn off its age-long hegemonic and autocratic governing style. Nigeria can never be one and peaceful country whereby out of over 48 top federal public office and non-ministerial appointments made so far by the Buhari’s Presidency; over 38 are given to northern Muslims, with only six given to the Southwest and four to South-south and zero to the Southeast; and whereby out of the country’s 17 public securitization headships, 13 are given to the northern Muslims, while only four (two of them made by former President Goodluck Jonathan), are given to the Southwest and the South-south, with the Southeast getting nothing. This sort of “Fulani Jihadist conquest of Hausaland and its jihadist rulership of its people till date” must not be allowed to rear its ugly heads in the politics of the entire Federation of Nigeria. Apart from the Buhari administration’s widespread violent attacks directed against the nonviolent and unarmed Pro-Biafra Agitation bodies particularly the IPOB; the Southeast deadly politicians have gone on the rampage against the IPOB and its leadership. Fearing the deepening possibility of going into irrelevance politically and socially; or losing political space and opportunities to loot and plunder as well as losing the opportunities to continue their enslavement of the people of their zone on account of the rising popularity of the IPOB and its thematic message in the Southeast and the South-south zones; these deadly politicians and their foot-soldiers on social media networks have colluded and are still colluding with the Buhari administration leading to massacre of over 200 innocent Pro-Biafra agitators and terminal injuries inflicted on over 300 others. Most of the dead and terminally shot victims are members of the IPOB and their supporters. Apart from participating in the mindless massacres and attempted murders above mentioned, the referenced deadly politicians have further gone on rampage, raising false alarms and creating false enmities between the Pro-Biafra Agitators, led by IPOB and some elder-statesmen and respected politicians of the Southeast extraction, particularly those who have spoken out against Federal Government’s widespread violent attacks against Pro-Biafra agitators as well as those that opted for dialogue and refused to lend their voices in support of the Buhari administration’s violent approaches and attacks under reference. For instance, the ongoing political persecution of the Senate Deputy President, Dr. Ike Ekweremadu, is substantial, if not totally traced to his several condemnations of the killing of innocent and unarmed citizens of the Southeast extraction by the Government of Gen Muhammadu Buhari and its proxy Fulani Janjaweed. Just the other day, attempts were made by the same deadly politicians to create enmity between the IPOB, its leader (Mazi Nnamdi Kanu-POC) and former Anambra State Governor, Peter Obi on one hand and between Peter Obi and former Vice President, Dr. Alex Ekwueme, on the other hand. The deadly politicians had falsely claimed that “Peter Obi had at an occasion in honour of an Igbo ministerial appointee in Enugu, openly spoke and launched vitriolic attacks against Mazi Nnamdi Kanu and his IPOB and that it took him to stop only when Dr. Alex Ekwueme intervened and rebuked him”. The story was investigated and it completely turned out to be false and deadly plotted. As a matter of fact, neither Peter Obi nor Dr. Alex Ekwueme spoke publicly at the event, not to talk of digressing from the event issue to talk in condemnation of Mazi Nnamdi Kanu and his IPOB. To put the records straight, the duo of Alex Ekwueme and Peter Obi had played and are still playing several mediatory, stabilizing and fatherly roles between the IPOB and the Federal Government and had also publicly made several calls for the release of Mazi Nnamdi Kanu unconditionally. They had also differently called on the Federal Government to dialogue with IPOB and its leadership. One of such open calls was made recently in Enugu during a pro-Igbo event, organized by Chief Eliot Uko’s Igbo Youth Movement (IYM) at which the duo of Ekwueme and Obi were in attendance. As if these were not enough, the deadly politicians last night of July 3, 2016 instructed their social media agents to concoct another falsehood to the effect that “Peter Obi was after the life of Mazi Nnamdi Kanu”; painting same as if it was solely authored or said by Mazi Nnamdi Kanu (POC) himself. We have since made contacts and found the story nakedly false. We, therefore, condemn the abominable roles of the deadly politicians above mentioned. We are aware that a lot of blood money has been couriered and is still being couriered from the Aso Rock for the purpose of sustaining the annihilation policy against the IPOB and its sister Pro-Biafra Agitating groups. Among those already benefiting from such blood money are deadly politicians in the corridors of power and those outside corridors of power in the Southeast and leprous leaderships of market bodies, community associations, churches and “rights” CSOs in the Southeast zone and beyond its shores. Also, among the IPOB ranks, moles have been procured by the Federal Government, planted and oiled with the blood money till date. 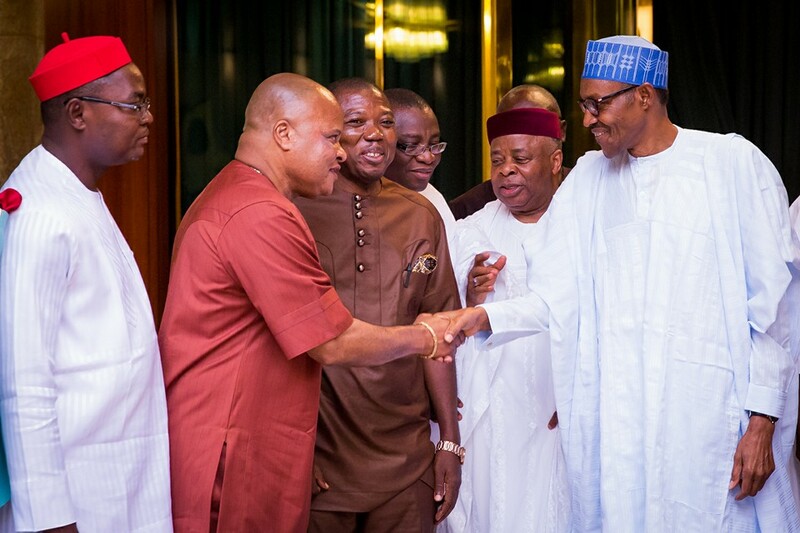 In all these, the leadership of IPOB deserves resounding commendation for refusing to be pushed to the wall or forced to abandon its nonviolence avowal. We urge the group not to be deterred or resort to violent and other clandestine approaches not minding the sustained violent attacks and other threats from the Buhari administration and deadly politicians of the Southeast extraction. The IPOB must also refuse to be distracted or create or accept false enmity where none exists. It is the conscientious duty of Politicians of the Southeast to see the other side of Pro-Biafra agitation (i.e. age-long structural violence and ceaseless State and its proxy group killing of Igbo citizens, etc) and take them up with the Buhari administration as part of the solution to the raging social discontents. This is a sacred duty expected of them and not the other way round. The leadership of IPOB must be told in clear terms that our advocacy support to it ceases instantly any moment it is credibly found and established that it has abandoned its nonviolence and civilized approaches. We also urge our politicians to play by the rules and desist from guerrilla politicking. A popular and grounded politician does not have time for deadly politics as he or she ought to be occupied at all times with how best to serve his or her people if elected. We urge deadly politicians of the Southeast to have a rethink in good time and borrow a leaf from the above mentioned. We especially thank those who have risen in strong condemnation of various regime atrocities against Pro-Biafra Agitation led by the IPOB and its leader, Mazi Nnamdi Kanu. Our particular commendation goes to the duo of a respected Lagos human rights lawyer, Barr Ebun Adegboruwa and Ekiti State fiery Executive Governor, Mr. Peter Ayodele Fayose. We urge the entire people of the Southeast and the South-south zones to keep in their minds at all times the present courageous steps of these two distinguished personalities and detribalized Nigerians ahead of imminent political re-alignments, cross-breeding, and cross-fertilizations, as late Dr. Kingsley Ozumba (K.O.) Mbadiwe once said, “when the come comes to the come, we become”. This are the full born Biafrans which all of us witnessed the experience of our enemies from 1967-1970 genocide war, which they are matured in age's but are not matured in the minds. None of them with their offsprings will see, nor can able to live in the promised land of Biafra, upon all this defiled and atrocities attitudes from them against their land. (Ana ga achu fa oso) Evang;S.AKUBUE-WILLIAMS. I'm really disappointed with Senator Ken Nnamani. I cannot understand how such a democrat and leader can even have anything to do with a military dictator and tyrant like Buhari. Ndigbo political leadership is under serious curse. They need deliverance.